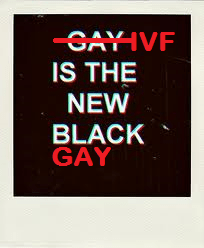 IVF is the new black and/or gay. If the gay rights struggle of the past several decades is a sign, then IVF fathers have a long way to go. More importantly, IVF children of IVF fathers have a long way to go to achieve equal rights. If it were 1794 and it was suggested to a person that if they don’t like being a slave, they should change the color of their skin. Instead of changing the color of the skin, it is better to be on the right side of history and change the laws. It is the same for innocent IVF children and families in 2014 and before. Instead of “accomodating” to the anti-IVF laws of today, let us get on the right side of history and get equal rights for IVF children and families. Mr. Rubin “Hurricane” Carter and may his soul rest in peace who fought racism for freedom and justice is a hero and a guiding light in the fight for IVF rights for freedom and justice. Just like gays, being ostracized, covering feelings, having to live with secrets, lies, being ridiculed for speaking up, loss of dignity, split from IVF children like a gay father would be, persecuted if asking for rights, so on and etc. In some countries in the world, you are hanged if you proclaim you are gay. If you are an IVF parent in the US, you may have to live in exile because your IVF child is not welcome to the US. The worst feeling as a parent is your status whether straight, gay, single, gender or otherwise is used against your innocent IVF children – for this any parent would speak up. If a woman has children through IVF, would her innocent IVF children be SPLIT because of her gender, infertility, immigration status, etc OR would the innocent, voiceless IVF children be united and be allowed to grow up together as intended? All we need is to look into the eyes of our innocent abandoned IVF daughter and our abducted IVF son who can’t see his sister despite his wishes and we know it is the right fight. The war on fertility creates innocent victims and kids are humans with their own human rights. It is traumatic enough to go through an IVF journey, each one is unique in its own way regardless whether you are a man or woman. To go through two such IVF journeys in secrecy and lies eventually SPLITTING the innocent IVF siblings is worse than a nightmare. It is an IVF holocaust. There are people in this world who believe that the holocaust never happened but that would be hateful and denying the facts. Worse it gives no closure to victims and continues to further victimize the innocent victims more and their families. Most people are not affected by IVF, even the ones who are not fully well aware of the risks and the lack of laws for IVF, that does not mean the IVF holocaust did not occur. Ignorance is one thing but once you have been notified of the facts including victimization of innocent children, we have to take action as a civilized society including equal rights for IVF children and families. Waterboarding the rights of innocent IVF children by suppressing the facts and drowning them out is still torture for IVF families. It is one thing to be a silent victim of violence, abuse, fraud, financial loss, emotional torture, legal nightmares, lack of justice but the result of silence to have been used to SPLIT innocent IVF siblings is far too traumatic and unjust. If gay fathers can tell their children about them being gay then why can’t IVF fathers tell their IVF child about IVF? Why should a court ban an IVF father from telling his IVF son the truth – is the court afraid of the truth? The fact is we are in an intersex marriage. If intersex people have specific concerns with current lack of laws, what concerns do intersex marriages have? The fact is there is an intersex marriage, there is an IVF child as a result. If the laws and courts are not equipped to deal with such human rights issues, is the best solution to suppress the facts, SPLIT the innocent IVF siblings and persecute the IVF father? What is so terrible in sharing with your children that one must respect all, once married, show love to the person by caring even if it breaks the laws? However, abandoning innocent children is a crime today and will remain a crime forever. Intersex marriages will become legal in future, intersex immigration will become legal future, equal rights for IVF children and families will become a reality in the future but even then abandoning IVF children will continue to remain a crime. Disrespecting the basic human dignity and respect of IVF children is a cause to speak up. If the IVF siblings had not been deliberately SPLIT up, abuse under silence may have continued. Today speaking up as an IVF parent, one gets ridiculed, ostracized. Speaking up for equal rights for intersex, same treatment. What part of the discrimination against intersex, immigrant, IVF haven’t we endured? Much like gay rights, the struggle is long but is the right struggle because NO child or parent ever should be split due to discriminatory laws or lack of laws.